Sir William Brereton (or Bryerton), of Alford, was the son of Sir Randle Brereton of Ipstones, Shocklach and Malpas, knight Chamberlain of Chester, and his wife Eleanor Dutton. The family owned lands, and was very powerful, in Cheshire. By 1521, he had become a Groom of the Privy Chamber. * A few years later, in 1529, he married the King’s second cousin, Lady Elizabeth Savage, but that didn’t stop him from seducing other women, gaining him the reputation of a womanizer. Nevertheless he was loved and trusted by the King and became a staunch Boleyn supporter. Brereton was asked by the King to deliver jewels to Anne Boleyn. He also gave Anne her beloved greyhound called Urian, after Brereton’s brother. Brereton was also given the job of riding up and down the country to collect signatures from the richest and most influential man in the land on a petition to persuade the Pope to grant the King a divorce. In addition, Brereton often accompanied Henry and Anne on hunting expeditions and, in 1533 he was one of the few witnesses present to their secret wedding. He also attended Anne’s coronation. So how could a man so close and trusted by the king be charged with being the Queen’s lover? Because he was a threat to Cromwell. The Duke of Richmond, the king’s illegitimate son, was one of Brereton’s patrons (the other was the Duke of Norfolk, Anne’s uncle). Brereton was his steward in the Welsh Marches, were he “exercised virtually autonomous territorial power in Cheshire and North Wales”**. In addition, he was chamberlain of Chester and steward of Holt Castle. From his crown offices and the estates granted to him by the king, Brereton enjoyed an income of £1.200 (£401.850). He was a very rich and powerful men and he was opposing Cromwell’s plans to replace feudal control in Wales with the establishment of english-style shires. He had to go. Personal animosity probably played a part too. Cromwell wasn’t the only one not to like Brereton, who didn’t hesitate to use his power and influence to get what he wanted or save his friends when they committed any crimes. George Cavendish describes him as “a persecutor of the innocent, an administrator whose justice was rigorous and driven by personal animosity”**. In 1518, a certain Master Swettenham had been killed while playing bowls. Allegedly, one of the killers was a relative of Brereton. The other his servant. Brereton helped the men to escape justice but was only fined 500 marks (£52,150) for it. In 1534, Brerton was convinced that a man called John ap Griffith Eyton had killed one of his retainers. Eyton was acquitted by a London court but Brereton was determined to see the man dead and, with Anne’s help, had him rearrested. Cromwell tried to save Eyton but he failed. Eyton was hanged. Like that wasn’t enough, that same year Brereton was supposed to be investigating bribery and corruption at Valle Crucis Abbey in North Wales but it seems he was probably involved in it too! Now, Brereton was around fifty when he was accused of being the Queen’s lover but his bad reputation, even as a womanizer, meant that people were willing to believe the rumours. Brereton, though, had no idea of what was planned for him until the May Day jousts of 1536. The king left abruptly after he received a note (probably telling him Mark Smeaton had confessed to adultery with the Queen, also implicating Brereton, Smeaton, Norris, Weston and Rochford) and Brereton was detained for questioning. On 4th May, he was formally arrested and taken to the Tower of London. The trial took place on 12th May. Together with Norris, Smeaton and Weston, Brereton was tried by a special commission of oyer and terminer, made up of men that had a grudge against the accused, owned favours to Cromwell or just didn’t want to anger the king. Brereton was charged with being the Queen’s lover but the dates in the indictment just didn’t make sense. Either the Queen was pregnant or not in the same place as Brereton so nothing could have happened between the two. But that didn’t matter. Just like Brereton proclaiming his innocence over and over again didn’t matter. The verdict had already been decided: guilty. 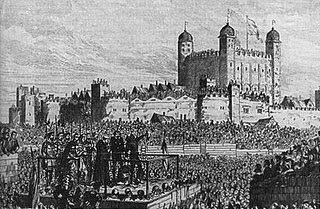 On 17th May, he was led to the scaffold on Tower Hill and beheaded. * According to Alison Weir’s The Lady In the Tower, he was promoted Gentleman of the Privy Chamber, but his position at the time of his death was still recorded as Groom. ** The Lady In The Tower by Alison Weird, chapter 5, page 131.